(1988/ZU-ZAZZ) 14 rare tracks (Sun Records 1953/54) few copies! Little Milton Campbell was by no means diminutive. Back home in Mississippi (he was born in Inverness on September 7, 1934), his dad was also named Milton, so something had to be done to differentiate between the two. "People would call him Big Milton and me Little Milton, meaning senior/junior," said the late guitarist. 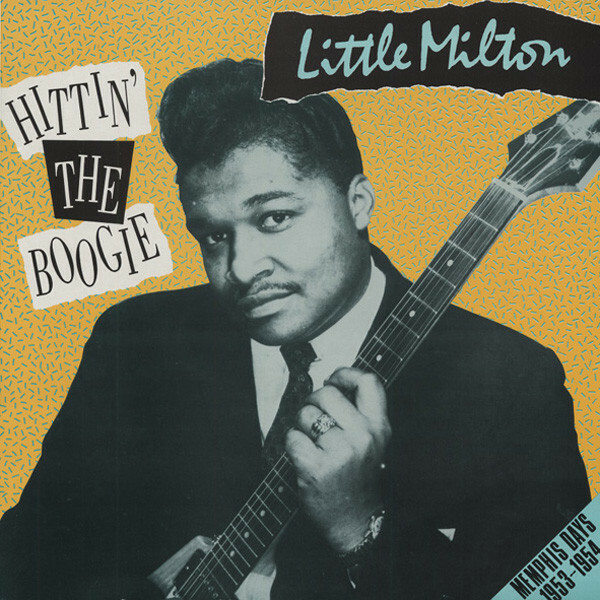 Milton was raised around Greenville and Leland in the blues-fertile state, picking up guitar as a youngster. "I started trying to fool around with it when I was about 12," he said. "I really liked and always idolized T-Bone Walker. To me, he was the greatest blues guitarist that ever lived, because he didn’t fuzz up his stuff. He just picked one string at a time. And this is what I do. I like to get all I can get out of one note." Greenville’s blues scene proved seductive; Campbell made his first trip into a recording studio with pianist Willie Love for Trumpet in 1951 at age 17. Another young Mississippian was Milton’s conduit to Sun Records in 1953. "Ike Turner took me to Sun Records for the first time and did records," he said. "We didn’t know what we were gonna do. Maybe we might have had a tune or two in our minds. But we’d just go in there, set up, start playing, and we came up with a good groove and a beat, and then we recorded it. It may be slow or fast. But actually, what the trend was, we’d go by hits that were playing on the jukeboxes and the radios. Whatever another artist had going, if it was a big record, everybody cashed in on it." Milton’s Sun debut Somebody Told Me did sound a tad familiar. "Didn’t that remind you of B.B. King’s ‘Woke Up This Morning?’" he asked. "Well, we had that in mind. What you would do was change the lyrics." After a pair of Sun encores and two more for Lester Bihari’s Memphis-based Meteor logo in 1957, Milton became the flagship artist for the brand-new Bobbin label in his adopted hometown of St. Louis. "Ike was there about a year. He moved from Clarksdale, Mississippi up there about a year before I did," said Milton. "He'd come back (home) occasionally, and he told me how good the pickings were. So then I came. And between him and I, we were working something like 14 gigs per week apiece. We'd work every night, and we would do three or four gigs Friday, Saturday, and Sunday. We was young and making money and having plenty fun! Launched in ’58, Bobbin was owned by Bob Lyons, station manager of KATZ radio in the Gateway City. That Will Never Do and its equally swinging opposite side I’m A Lonely Man were done late that year at the station with saxists Oliver Sain, James Carr, and Vernon Harrell, trumpeter Larry Prothro, bassist Willie Dotson, drummer Jerry Walker, and an unknown pianist. Milton wrote both sides himself and played stinging lead guitar. "I think I was really beginning to discover Little Milton as an artist back then," he said. "Finally, I got into a thing where I just felt comfortable doing tunes a certain way. Regardless of whose tunes or what tunes I did, I did ‘em me." That would be the case on his next six Bobbin singles, stretching into 1960. "Oliver Sain was the bandleader," he said. "Fontella Bass was the female vocalist for me, and the keyboard player. It brings back so many beautiful memories, man. It really does." Customer evaluation for "Hittin' The Boogie - Memphis Days"